Modern Poetry in Translation (MPT) has had a radical change of image. We have been working with Katy Mawhood at Reading University’s Department of Typography to produce a magazine that both refers back to the iconic designs by Richard Hollis in the 1960s and 1970s, and is contemporary and fresh in look and feel. You may like to read her thoughts on the design of MPT inside this issue. The cover of each issue will be illustrated by an international artist. This Spring Perienne Christian has responded to poems in the issue by celebrated Dutch poet Toon Tellegen to produce an extraordinary and unsettling piece of cover art ‘Transmogrification’. We have returned to the original bible paper and simplicity of typeface. MPT will now appear three times a year, rather than two, although subscriptions will remain at the same price. It will be distributed more widely into bookshops and galleries, and it will now be sold for the first time as an e-book (from May). The spirit of MPT is unaltered: we publish the best world poetry in the best translation. 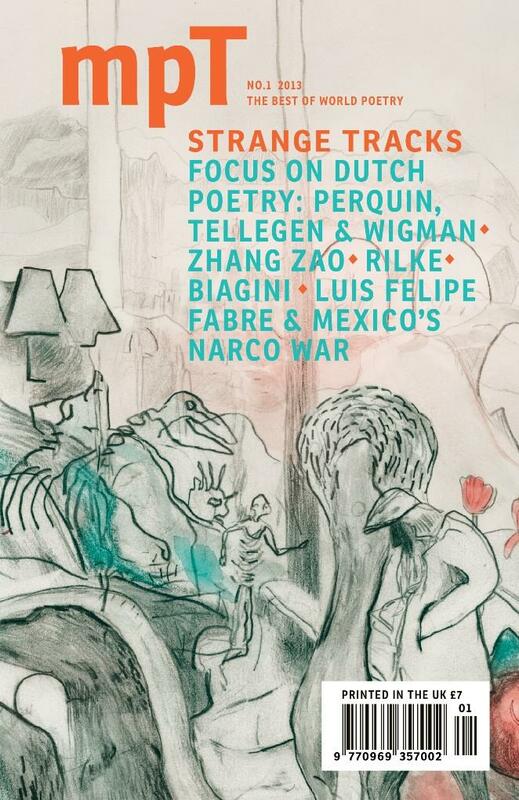 Our Spring issue ‘Strange Tracks’ features new poems from Argentina, Venezuela, China and Italy, poems about the casualties of the Mexican drug wars by Luis Felipe Fabre and Valérie Rouzeau’s Apollinaire Prize-winning poems in Susan Wicks’ translations. A new translation of Baudelaire’s ‘Le Voyage’ by Australian poet Jan Owen and a reworking of Bertrand’s ‘Gaspard de la Nuit’ by Stuart Henson demonstrate our continuing belief in the modernity of new translations of classic poetry. Each new issue of MPT will have a special focus, and this Spring we celebrate the extraordinary renaissance of poetry in the Netherlands with poems by Popescu winner Toon Tellegen, 2012 VSB Poetry Prize winner Ester Perquin, and Menno Wigman. The focus includes an interview with Tellegen and his translator Judith Wilkinson. Alongside Valérie Rouzeau they will help us launch the new MPT at the Brighton Festival on 4th May.